In many cases, a full warehouse might just imply inadequate shelving. Make sure you use the full height of your warehouse by choosing the right type of racking. Adding a mezzanine or platform shelving is one way to gain vertical space in the warehouse. Aisle space can also be reduced depending on the equipment used. Investing in redesigning your warehouse can repay for itself in a short period of time. Effective slotting requires that the location for each product should be determined by its size and the product velocity. Fast-selling products, and larger products that may require the use of forklifts, should be kept nearer to packing and freight terminals so as to reduce travel time. Considering the right picking method based on the type of product and the type of orders also reduces travel time. Some of the methods are batch picking, zone picking, pick and pass, pick to cart, etc. Reduce the number of times a worker is required to handle products. The fewer the touches to a product, the less the cost of shipping an order. Material handling doesn’t create value and every minute saved in picking, moving, sorting or stocking material is a minute that can be put to use elsewhere. Streamlining operations by using proper slotting practices can reduce handling and significantly bring down the cost of fulfilling an order. Unloading goods from an incoming truck and loading them directly into outbound trucks, or cross docking, is an effective practice to reduce handling and shipping costs while improving customer service. Examine your product mix to make sure you’re buying in the correct numbers of each item based on its turnover. Warehouse management systems can help determine optimal inventory sizes at any given time and notify you about potential shortfalls or excesses. By keeping inventory levels closely pegged to demand, you can increase the throughput of your warehouse. 3PLs can expend a significant amount of time and money on recruiting and hiring employees, only to find that turnover rates remain high. Retaining workers in the long term requires some effort in the initial training period. Creating training manuals can save time and make the training period more effective, while also enabling new employees to learn about their specific job, the company and its work culture. Clearly documenting the various functions an employee must perform and specifying the expected output for a given job can help employees better understand what is expected of them. Setting and providing targets to workers is important. Creating quantitative measures can aid in setting individual goals for employees and improve their productivity and accountability. By collecting the actual performance of workers and comparing it to the goals set, you can get a better picture of the various processes taking place. This data can be used to identify areas of high performance and those with comparable inefficiencies. You may even display the data in periodic graphs to show actual versus plan metrics such as total error rate, cost per transaction, reported savings, etc. These provide workers with real-time input as well as motivation. Doing all this manually can be cumbersome and prone to error. 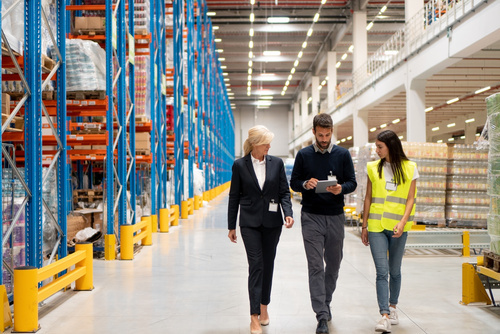 Integrating labor management into a warehouse management system can reduce costs, time and human error related to planning workforce schedules and tracking their actual progress. Apart from higher efficiency, setting up goals also allows you to recognize the most productive and trustworthy employees and implement a reward system. As already mentioned before, posting results can provide meaningful feedback to employees and motivate them to meet or exceed expectations. By highlighting individual record holders in various functions, management can create a friendly competition on the warehouse floor. Reward employees by moving them up the ladder. Place people in positions where they have a good chance to succeed. People will work harder, and be more likely to stay on, when they see there is possibility for career growth. It isn’t only your employees that gain from feedback. By establishing a clear and transparent exit interview process you can gain insights into why people leave. This can help you take steps to reduce turnover.